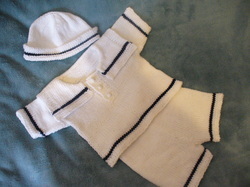 Summer Sailor Suit Sale £5 off! The complete Kit to make your own adorable suit in pure machine washable cotton. Easy to knit with clear instructions and photos that show any new technique, this kit would make a perfect gift for a new mother or grandmother. Thanks for the super speedy service. I have not knitted for 20 years and found the pattern so easy to follow!.Delighted with the result. Mrs. T. Pollak, London.